higher temperature for short durations. 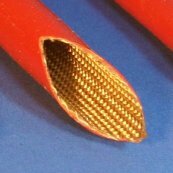 FlameShieldä thin-wall high temperature, heat, flame and fire resistant firesleeve is the perfect choice for protecting small diameter pneumatic lines, brake lines, wires and cables from exposure to high and extreme heat conditions. 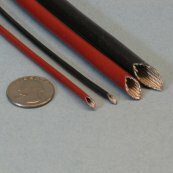 The thin-wall fiberglass substrate and smooth silicone rubber on this firesleeve sheds molten metals, slag, welding splatter, electrical or grinding sparks and contamination. Also provides protection from ozone, UV and abrasion. 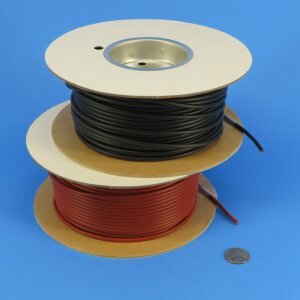 This product is UL/CSA approved and used on a wide variety of equipment such as fixtures, appliances and motors for wiring protection. This sleeve is available only in oxide-red and black. This sleeve is only available in full spool lengths shown in the catalog.